In 2006, wealthy and highly successful record breaker Steve Fossett announced that he had bought Craig Breedlove's 1997 Spirit of America car for a 2008 attempt on the World Land Speed Record. Although there are doubts about the cars aerodynamics, there were no doubts about Fossett's legendary ability to finance and execute such a project. Richard Noble and Andy Green decided that a defender vehicle was needed and outline work started using earlier work undertaken by Ron Ayers and Glynne Bowsher as a start point. The original concept called for a twin rocket vehicle but since the vehicle is primarily a research vehicle requiring fine control of the power output to hit and hold target mach numbers, the rockets are not sufficiently controllable and so a single jet/single rocket arrangement was planned. The very original arrangement allows low cost slow to mid range operation of the car on the jet engine alone, before bringing in rocket power for the high speed increments. The next significant advance was on January 9th 2007 when Green and Noble were invited for a meeting with Lord Paul Drayson - the objective being to enquire about availability of the early development Eurojet EJ200 engines. Lord Drayson, then MOD minister for Defence Equipment and Supply, had other ideas. He had stumbled on a major MOD problem - shortage of engineers and deficiencies in the education supply chain. He recalled that there were no such problems in the last century when Britain was developing iconic aerospace projects such as Vulcan, Fairey Delta2, TSR2, Concorde and Harrier, and he had deduced that this was because the projects were highly innovative with wartime production and operation activity , they inspired school children on a huge scale. If Noble and Green would set out to achieve an iconic project and run it through the UK schools, then the MOD might be supportive. I confirmed with the Minister that we would do it. After all with the Thrust2 and ThrustSSC projects we knew that a large number of school children had taken up scientific and engineering careers as a result of Thrust2 and ThrustSSC. The project was codenamed Bloodhound after Ron Ayers 1960's SAM missile, the Bristol Bloodhound, which was a main element in Britain's defence system for some 20 years. The Bloodhound 2 missile would accelerate from 0-Mach 2 in 4 seconds. The codename stuck and the Project is identified as the Bloodhound Engineering Adventure. The adventure is the correct terminology because the eventual outcome of the project is of course not known and much is going to be learned in the process. The project grew very quickly, starting with Swansea University who obtained EPSRC funding for the aerodynamics research programmes which follows on from the huge contribution they made to the ThrustSSC design. Very shortly after, the University took up the Founder Sponsorship contract which gave them a perpetual advert on the car in return for financial sponsorship during the high risk research phase - when the project was at serious of risk of cancellation due to technical inability to complete the programme. The research phase was incredibly high risk because of the absolutely unknown technology. The project may well have proved to be of such a high risk that proceeding from research to development would be a waste of resource, and hence the project would have to be terminated. It would be highly embarrassing to all if the project were announced and then cancelled with an admission of technical defeat and public waste of money. Better to keep it all a secret during the research phase and then announce it when we know we can do it. So over the 18 months of the research, well in excess of 1000 people signed the project confidentiality agreements! When the project was eventually launched in October 2008, the media had no idea of what had been developed and wondered how we had managed to keep such a large programme so quiet. The Bloodhound SSC is a totally unique vehicle unlike nothing we have ever seen before. It is capable of acceleration to 1000mph in 55 seconds - in a much shorter time than it took Thrust2 to reach 650mph (70 seconds). The wheels rotate 170 times a second and the car will go through the measured mile in 3.6 seconds. The project was launched in the Science Museum by Lord Drayson (later to become the Labour Govt Science Minister before the fall of the Government in May 2010) and 300 journalists attended together with a number of live television feeds. The 5 day Bloodhound exhibition in the Museum attracted 9000 visitors and was classed as the museum's most successful live event. Gross media coverage was valued at £2m AVE and the Supporters Club put on 400 members in 30 days. The schools programme is being widely encouraged though to meet our targets the education effort is going to be considerable. A key turning point in the project was our meetings with the STEM (science technology engineering mathematics ) teachers where we took an exhibition stand at the BETT education show at the NEC. The STEM teachers were under no illusion; due to the almost total lack of engineering exposure on the media , the school kids were almost entirely influenced by online gaming and television activity , the former being fake and the latter being reduced to the cheapest programming of singing dancing, and cooking. Engineering didn't seem to feature and the schoolkids were unaware of the tremendous opportunities and careers. The teachers wanted us to make all the car data available live as the car ran so they could follow the project in the classrooms. It took us a long time to realise that this was to be the projects unique selling proposition. Because the design restrictions on land speed record cars are minimal (basically four or more wheels and controlled by the driver) all competitive land speed record cars tend to differ substantially in design. Because the cars are effectively research pioneers using unproven theories and technology, any unproven design feature of one car is most unlikely to be of any value to a competitor who would have their own ideas. Thus, unlike conventional circuit based motor sport where there are considerable databases of experience, and design details need to be hidden in a culture of extreme secrecy, there is no reason why the land Speed record technology should not be published widely and made fully available to all schools so that the technology can be studied in depth concurrently as the car is developed. This feature is absolutely unique to the LSR cars and makes the school programme incredibly valuable. Similar schools projects have been tried with NASA, EASA and Defence Contractors, but IPR and defence secrets make it impossible to share significant content with the schools - thus there are severe limitations to what is possible elsewhere. At that stage it seemed impossible to conceive that by 2014 Bloodhound education would have increased to 5,600 schools and that school kids would be building record breaking 550 mph model rocket cars. As the project advanced, so the country's financial situation began to deteriorate - and we were being faced with a truly wonderful project with real educational prospects and serious difficulty in financing it. A sensible argument would be to freeze the programme rather than run into all the certain difficulties and financial uncertainties of operating in a very inhospitable financial climate. One of the sponsorship agencies explained it - "We think that the traditional sponsorship market is shot to pieces and traditional sponsorships will dry up. But Bloodhound is so unique and different that the chances are that it might survive". The above part of this copy was written in 2008 and the really hard part of the project was about to follow. With the ThrustSSC project we had been able to create the shape of the car relatively easily. The idea had come from the three project initiators and the CFD and rocket test programme demonstrated that it was safe and would work. Bloodhound at Mach 1.4 was going to be very different. Effectively there are two different approaches to designing such a vehicle the first is to work out an outline of the design and then put it through the CFD (computational Fluid Dynamics) process if the aero shape works then the design can be populated with all the components and the project progresses. This is initially a low cost programme because the design focuses only on the aero performance the real costs comes later when the deficiencies of the outline design become apparent and the design has to be altered resulting in a no longer ideal aero solution. The original aero solution becomes lost as it never was holistically valid. The second method is to painstaking design the car then put it through the CFD process knowing that if the CFD result is favourable the car is holistically viable. With Bloodhound, we chose this expensive method because we had learned that minute changes to the car shape can have a huge impact at these speeds where the dynamic pressure (air pressure on the car surfaces) will be 12.5 tonnes per sq metre. The design process was an utter nightmare. Each design cycle cost £150,000 excluding CFD costs for which the budget was £750,000. We had to go through 10 design cycles until we had a viable solution - a lift neutral design where the high pressure shockwaves were controlled with innovative understanding of shock wave control. Much of the final work was achieved with help from Rolls-Royce and Intel which enabled a large number of outline runs to be made on detailed sections of the design enabling us to discover for the first time ever what worked and how to incorporate it. As an example of the extreme frustration we believed that the design was within reach in October 2009 a full year after the project announcement. We announced to the World that we were going ahead to build. Two weeks later the favoured design failed more CFD tests and it would take another 5 months before we would achieve the safe design. In parallel with all this, the car's rocket motor had to be developed. This was achieved by a small team based in Manchester and California, and because there was no developed technology, the hybrid rocket would have to be developed from scratch. 10 firings were achieved of the small 6 inch development rocket and in November 2009, the first 30% power firing of the huge 18inch rocket was achieved in the US and then again in October 2012 the largest hybrid rocket ever developed in Europe. At this point the reality of the rocket programme struck home - rocket motors do not scale easily and thus the results of the small development rockets was of limited value. To make the original full scale rocket safe enough to accompany Andy in the car and to achieve target power we would need to commit to a massive rocket development programme with a very large number of firings. With the limitations of the sponsorship budgets, this would be impossible to finance. So the rocket programme was not restarted after the UK full scale firing which was watched by 170,000 people on the internet. It wasn't restarted because the only way forward was to find ourselves a rocket partner. While the car programme was developing at a hugely expensive and frustrating pace, the education programme was finding its feet. By early 2010, there were 3,000 UK schools on the programme which rose to 3,800 by August 2010. Back in 2008 we had had a the key meeting with the executive board of the Northern Cape Government. They had decided to make available the incredibly flat Hakskeenpan desert for us on which to run the Bloodhound SSC. The US deserts on which we had run Thrust 2 and ThrustSSC were no longer viable. But there were problems on the South African desert - 21 million square metres of stones and a road on a causeway crossing the mid point of the track. In an amazing programme of biblical proportions, the Northern Cape Government set about removing both road and stones with three years of effort from 310 local people who cleared over 10,000 tonnes of stones by hand. In addition the giant MTN mobile phone service provider decided to help as well, erecting 4 permanent 70 metre high radio masts which would enable us to transport the data signals from the car to the town of Upington where the signals would go into the internet fibre. We could provide live data coverage from the car to the web and hence to the World, just as the teachers had requested. By July 2010, the build plans were in place and the car build beginning to develop from the project base in Bristol. The cost to build the car we thought would be £6.2m being £4.2m in cash and £2m in product support from 220 companies - the plan being to roll out the car in December 2011, ready for UK runs in January 2012. The financing of the project has been a complete nightmare with everyone knowing that the project must be seen to advance continuously or else fail. To advance continuously means a massive growth each year or facing being dismissed by the public as a project which will take 20 years to come to fruition. Somehow despite extreme difficulty, the project must always be seen to be advancing and taking on its immediate challenges; it is this very discipline and risk-taking which encourages more sponsors to join. We were in for a very rough time. The project's main objective is to create a new generation of engineers and scientists, and to do this all the Bloodhound design and operational data is to be made available on the web, something that the Defence or Space or Motor Race industries could never do. All this sounds fine in theory a true open source project, but unless the school kids could understand the data, there would be little point in putting it out. The focus is of course on those at the ages of 5-7 who might take an interest in science and engineering rather than providing an entertainment for those who are already training to become professional engineers. So there is a major focus on making that data understandable. At first sight it might be seen that the education programme is an unnecessary accessory for the project adding cost and complication. In fact it is becoming clear that without the education programme the project funding would die, reducing the programme to a very high risk backyard operation. As we know from the ThrustSSC Project, the technology is essential to reducing risk and enabling a satisfactory conclusion. By August 2010 we were convinced we would have a completed car by 2012. We were so very wrong - the engineering proved very difficult to plan and hence the programme became very difficult to cost or even predict. It was only in 2013 that we realised we would not get the car until 2015. The real problems were the innovation, the huge levels of new technology and the time it took to solve each problem and still maintain a safe project. It was only when the innovation was settled that the project could have a credible defined and costed plan. By years end of 2013, I was not looking forward to 2014. If we had only just scraped through 2013 how on earth could be make it through 2014 with another 50% expansion? In August 2010, I had been worried about a monthly cost of £225,000, by 2014 with the massive manufacturing programme underway the costs were to peak at £600,000/month. But despite all the difficulties and the huge fight to survive, by 2013 Nammo had joined us to take charge of the rocket motor programme, developing a similar hybrid rocket motor but with advanced combustion technology and a sizable rocket motor factory to provide the essential support. With the support of Castrol, Rolex and Jaguar, it became clear that against all odds we could make it through 2014 and deliver the car in 2015. By the end of October 2014 there were 5,670 UK schools studying Bloodhound and in 2014 I happened to meet one of the first Bloodhound students who had made it to Cambridge and was now in his first year. The project is now being followed in 238 countries and to date 18 million views have been made of the ThrustSSC record runs. The Bloodhound 1K club has 6,500 paid up members and 23,500 members of the public have their names on the Bloodhound SSC fin. We are going to be on the desert in 2015 with an operational Bloodhound SSC, but we still have a very long way to go. You can follow this project at www.bloodhoundssc.com, and on Facebook and Twitter. Just very occasionally, there is a real need to escape the everyday pain of trying to earn a living and break free into a totally different dimension. During World War 2, Richard Noble's father had fought with the Cameron Highlanders in the Western Desert Campaign, and later brought his family to Tripoli, Libya when posted the as part of the British peacekeeping initiative during the run up to Libyan independence. 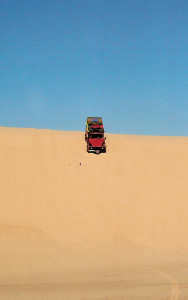 Richard acquired a lifelong passion for deserts which had led to the London/Capetown expedition of 1972. In 1941, the newly formed Long Range Desert Group, undertook a quite incredible raid which resulted in substantial tactical change in the desert war then being fought along the Libyan, Egyptian and later Tunisian coastlines. 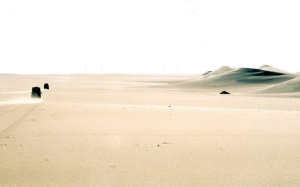 The Axis forces were using many of the remote desert oases as supply dumps, confident in the knowledge that they were inaccessible to the Allies and therefore did not need protection. The LDG decided on a iconic raid as a curtain raiser - G Patrol and T Patrol (76 men and 23 cars) would track from Cairo straight across 1000 miles of the Sahara desert to the oasis of Muzurk, capital of Fezzan, and destroy the Axis supplies there. This extraordinary and historic raid had an incredible affect on the Axis who were then forced to protect their desert oases with front line troops. The rerun of the Muzurk raid was the ideal of Kit Constable-Maxwell and his friend and navigator Dr Raymond Bird, veteran of 40 years of extraordinary travel. Accordingly, a couple of G4 Land Rover Defenders were borrowed from Land-Rover and a small team assembled, including Crispin Clay, Simon Montford and Nick Robinson. Key to the success of the venture was our Libyan guide Mamdu, who had never visited this remote region but who could read the sand and the dunes with astonishing accuracy. The 6,000 miles route started and finished in Hampshire, crossed the Mediterranean to Tunis and then tracked along the Libyan coastline to Tobruk, before heading due South to Jagbub and the Kolansho sand sea crossing. In keeping with the LRDG tradition, the team carried all food and supplies with them - being 300 litres of fuel and 140 litres of water per truck. 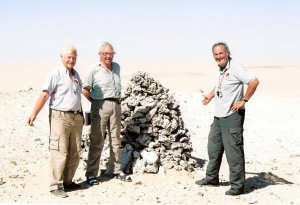 After crossing the Kolansho the team headed East into Egypt to find the famous LRDG Big Cairn built by Clayton in 1932. Having routed South almost as far as the Kufra oasis, the team then tracked West to the amazing Waw Al Namus crater (3.50 kilometre diameter blackened and water filled crater in the middle of the Sahara). On the way towards Muzurk, the team found an abandoned WW2 Chevrolet possibly LRDG truck and an Italian biplane that crashed in 1923. In Muzurk, they found the fort and hangar that head been raided by the LRDG. Overall, the trip took one month and 6,000 miles intense driving. The Defenders had no mechanical faults or punctures. The trip was a real inspiration and a reminder of the incredible feats performed on a daily basis by the LRDG and their two wheel drive Chevrolet trucks. We plan more deep exploration trips when time and circumstances allow. TFD was developed from the learning acquired from the AMA period 1973-74 and the extraordinary success of the application in the ThrustSSC project. 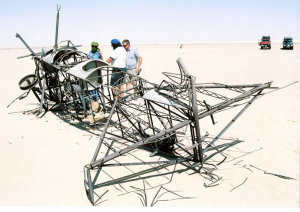 Many people were amazed that the ThrustSSC project was achieved with just 13 fulltime team, though the Black Rock Desert Team amounted to 33 which included 20 part timers. The productivity of the ThrustSSC team was prodigious: designing and building the supersonic car, running a 231 company supply chain, a 5,000 person supporters club as well as the overseas logistics and preparations, the website and the onsite development programmes. When asked to guess how many people worked on the ThrustSSC programme, many would guess at 60-100 people. There was never sufficient resource to fund a venture on that scale, so the solution lay in the flat structure and special culture we developed. In a normal hierarchical structured company, all decisions are taken at the top and whilst there is delegation of responsibility, there is minimal delegation of authority. This means that individuals are delegated responsibility for some activity, but lacking the authority to implement, they have to report back for authority to proceed. All this takes time which is at a premium in a very fast moving business environment. Another important fact is that in today's very fast moving very creative business environment, constant corporate decision making is required - and if that decision making is made high up the corporate pyramid, then the decision-makers quickly become overwhelmed - decisions are made slowly and often too late to take advantage of the opportunity. In the ThrustSSC project, the entire organisation was flat with everyone at equal status. Everyone had their role carefully defined and they were empowered and accountable, which meant that decision making was fast and slick with no need to refer back. But we quickly learned that just empowering our people was not enough - we had to develop a whole new supervision-free culture. In a hierarchical structure, it is well known that a great deal of individual's time is taken up with non functional activities - eg management politics etc. The AMA had a chart which showed that the lowest supervisor could be expected to spend 10% of his/her time on management and 90% on functional activity. By the time that the focus had moved to the chief executive the opposite was true - he/she was expected to spend 90% of their time on management issues and 10% of available time on functional activity . Thus traditional companies have a culture of hierarchical non-production - and this means more people are needed together with increased overhead cost. It also means that the company tends to be very slow, communicates through its layers poorly and is extremely expensive with very heavy overheads. We quickly learned that the flat company and empowerment was not enough - we had to develop a specialist teamwork culture. In a traditional company, much energy is wasted in fruitless and worthless internecine warfare and that culture requires that every executive develops combat experience - and keeps in regular practice. Although this is seen as good macho development, the reality is that it wastes time and resources and creates appalling communication failures. The ThrustSSC collaborative culture was developed around the application of small groups where the leadership was passed around according to whom was best placed (temporarily) to lead. An example of this was the epic story of the Machmeter. ThrustSSC has a Machmeter on the panel which displays the airflow speed as a percentage of the local speed of sound. The instrument creates its reading from comparing two air pressures - one, the dynamic, is simply a small hole at the front end of the long ThrustSSC nose - the other is a reference pressure which in an aircraft application is normally a small hole somewhere on the side of the aircraft fuselage. Locating the small hole is the big problem: a specialist company kindly offered to sort this for us at a cost of $180,000 and three months work. We didn't have $180,000 and we certainly never had three months available in the programme. The problem bounced back to the ThrustSSC design team who designed and implemented the solution within 24hours using a vacuum flask and a tap - total cost ? $50.!! This was an example of classic ThrustSSC teamworking - and it was for this reason that ThrustSSC never had a chief engineer! Any organisation can be broken down into small groups of not more than 15 in number and the team members unwound from their traditional hierarchical learning and impedimentia - and then give a new non combative collaborative culture based on working together and building mutual respect. The effect this has on the company is quite amazing and very often staff under performing in a traditional company, shine brightly with the new culture. There are extraordinarily high levels of personal motivation. Above all, the company develops an extraordinary aura of competence, diligence, speed and enjoyment. This brings in more companies and people who want to work with you and experience the buzz. With Thrust SSC, we had to try to stop people working 7 days a week. Staff turnover was almost non existent and when people had to leave there was usually a replacement immediately available - we almost never recruited. The JCB company with a 12% market share of the Global Construction Machinery Suppliers Market had long planned to manufacture its own diesel engine for backhoe and other JCB products . Such an engine requires an output of around 80BHP and bullet proof construction. Looking at the design one day, Chairman Sir Anthony Bamford realised the JCB 444 engine's sturdy construction might enable it to be significantly uprated and in order to promote the new engine, he decided to consider a record breaker project. Richard was called in and it quickly became apparent that whilst the existing record was a mere 235mph, there had been Bonneville passes at 282mph (the late Carl Heap's amazing Phoenix 1950's converted quarry truck!) 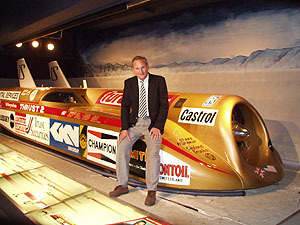 and a similar speed by Roy Lewis' Chassis Engineering - currently the Worlds fastest unlimited diesel according to SCTA. Clearly the JCB vehicle would have to achieve a significantly faster record than 300mph and achieve it in a very short programme in order to coincide with JCB's plans for US promotion. Sir Anthony Bamford made it very clear that he was undertaking the project for JCB to promote the engine and as a stimulus for British Engineers. He also made it very clear that he wanted the project managed and carried out by JCB staff wherever possible. Richard came up with the basic twin engine design incorporating the twin 444 engines, based on the Railton Mobil Special with each engine driving a set of wheels but uncoupled. Ron Ayers of ThrustSSC fame undertook the initial performance studies, and with Ricardo's engine performance estimates of 750BHP using twin stage turbocharging at over 5bar, he was able to predict a performance well above 300mph. Instead of sitting in front of the engine mass as John Cobb did in 1937, Ricardo studies showed that the safest	position for the driver was between the engines. 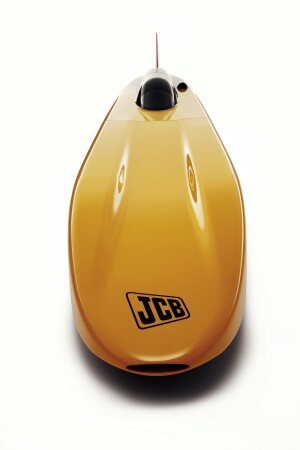 Like the Railton, the JCB DieselMax would feature ice cooling from its 200 litre ice tank. The extensive engine development was undertaken at Ricardo Shoreham and involved surprisingly little major change to the basic engine other than crankshaft, conrods, pistons, valves and a dry sump oil system as the engines had to be inclined to minimise cross-sectional area. Obviously there had to be major changes to the fuel and turbocharging components. Richard found himself as an unofficial mentor to the project which is run by Dr Tim Leverton, JCB Group Engineering Director. This, Richard found, is a surprisingly different role since he had no status or authority in the project and he felt it very important to pass on what he had learned from the ThrustSSC project, though the	culture was completely different. Clearly an adviser who just brings good news is not doing his job and so Richard found himself being something of a pessimist in order to keep the team advised of the pitfalls in the road ahead. Richard brought in Ron Ayers from ThrustSSC on aerodynamics, Andy Green as driver, and logistics help from Martyn Davidson, ThrustSSC's brilliant Logistics and Operations Director. Richard also learned how very difficult a task it is to design and build a wheel driven car since the margins can be slim and weight control, cross-sectional area and engine performance are critical factors. There are also crucial decisions around transmission and tyres, which mercifully never featured on the jet powered Thrust cars. Capable designer John Piper from Visioneering took on the detailed design and build, and brought his valuable F1 experience with Williams F1. The press launch was achieved on April 20th 2006 with a good response and final construction began ready for the UK testing in July and an appearance at Bonneville Speed Week for August - to be followed by the record attempt the following week. By July 2006, the JCB DieselMax was ready for UK trials at RAF Wittering using the northern taxiway. The first run was achieved on July 22nd, perilously close to departure time for the US. And finally the team achieved its go/no go proving speed of 200mph on July 30th. The 2006 Bonneville Salt Flats was a mixed experience for the JCB DieselMax team, with complex engine problems for the first week and then finally it all came together for the record week with FIA records of 328.767mph on August 22nd and 350.092 mph on August 23rd with a peak speed of 365mph. The car's performance was held back by the tyres which had been cleared to 350mph only. With new tyres and a touch more power the JCB Dieselmax has a 400mph potential. The fastest ever wheel driven record is still 458mph, which puts the JCB performance into perspective. On Feb 5th 2007, it was announced that the JCB DieselMax Team had been awarded the Dewar Trophy for outstanding British technical achievement in the automotive World. This was awarded at a special ceremony at the RAC Club on March 13th 2007. You can follow this project at www.jcbdieselmax.com or acquire a copy of Dave Tremayne's book - "The World's Fastest Diesel" published by Haynes, ISBN 1 84425 420 8. While speaking at Dell Computers' annual conference in 1998, Richard learned that Dell was planning a 100% expansion and that their major problem was positioning senior sales staff in Europe. Business jets were too expensive and requiring the same long runways as the airlines, operated off similar airfields. In desperation Dell had returned its executives to the airlines and the European President explained that the inefficiency could be costing them $10m a year. As private pilot since 1982, Richard realised that the airlines were blindly pressing on with the old business model and their use of ever larger aircraft meant that they had to load their planes from ever larger airports positioned at major centres of population. It had got so bad that 90% of all US airline travel was through just 45 airports. After September 11th, the additional security and longer check-in times filled the airport terminals and absolutely clogged the system. For years Richard had used his Super2 aircraft for travel between the many small airports - there are 5,000 in the US and 2,000 in Europe. Clearly what the Dell people (and many thousands of harassed business people) needed was an internet-booked taxi that could fly effortlessly between the small airports, thus providing point-to-point travel on demand at reasonable prices. Curiously, studies showed that 97% of business people travel only in groups of 1-3 (look at a London taxi in working hours) and so a small aircraft was needed. In 1998 the Federal Aviation Administration of the US allowed Single Engine Instrument Flight Rules. This replaced an old rule that went back to the early days of flight when the aero-engines were less than reliable. The old rule stated that if you wanted to fly paying passengers commercially in weather which required flight by instruments (Instrument Flight Rules) then your aircraft had to have two or more engines. The new rule took account of the incredible reliability of turboprop engines like the Pratt & Whitney PT6 which had a shut down rate of 1 in 250,000 flying hours. The rule meant that a new type of commercial aircraft became possible - one that didn't have to carry a spare engine and systems around for safety. The new single-engine aircraft would be far more economical, potentially faster and actually safer. Also in the US, NASA embarked on a similar programme, the $100m Small Aircraft Transportation System (SATS) designed to bring the 5,000 small airfields into play as a part of the US transportation system. They also found that 90% of the US population lived within a 20 min drive of their local airport (same in the UK). The 5 passenger F1 aircraft therefore has to be a mixture between a Spitfire and London Black Cab. It has to fly slowly to land on small airfields (2,000 runways) and fast enough to rival the airliners (320 knots). It also has to have an airspace level to itself (25-29,000ft). Unlike the hand-made aircraft of today, the F1 also has to be suitable for mass production. Initial funding for the project was almost impossible because of the well documented British reluctance to back major products. The start up was financed by unsolicited investors off the internet and by POS 1995 share sales to the company's Farnborough Airforce Supporters Club. The small team put huge personal effort into the design of the F1, using the latest software to predict performance and optimise the aircraft. As an example, Dr. Gordon Robinson evaluated 300 wing designs before he achieved the wing that gives the F1 best in class performance. The use of the new software enabled the F1 to be totally optimised for its role and for the performance to be closely predicted. It thus became possible for the first time to predict with accuracy that the F1 would become the market leader - because the optimisation gives it such a huge advance in payload/range/speed, and it can access 97% of the airfields in North America and Europe. The F1 is a predictable winner right off the screen. By summer 2001 the company was in crisis, having grown its engineering team substantially and outgrown its funding method. A single investor supported the company through the Autumn and in 2002 the Intellectual Property Rights were valued at $50m on an ongoing basis. Around that time a furious legal battle ensued for the right to develop and exploit the F1 design and at an EGM on July 8th the 450 shareholders voted by a majority of less than 1% to pass the design rights to a new company, Farnborough Aircraft Corporation Ltd. Noble resigned and for a number of key reasons refused to join the new company. Although communication with the shareholders was promised by the new company, this has not been forthcoming and it appears that a derivative of the F1 is flying in the US as the EPIC and there is talk of F1 production in Dubai. The market for the small jets and the F1 type taxi aircraft is currently maturing and it will be interesting to see whether the early F1 predictions made at such an early stage of market development still hold true. 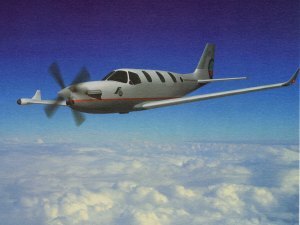 You can study and follow the project on www.Farnborough-Aircraft.com. 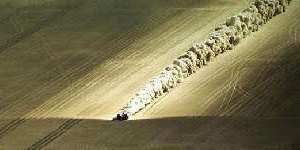 By 1990 the World Land Speed Record was active again. The Americans were planning a major challenge and in the UK the McLaren F1 team were also planning a supersonic challenge, with a £25m budget. 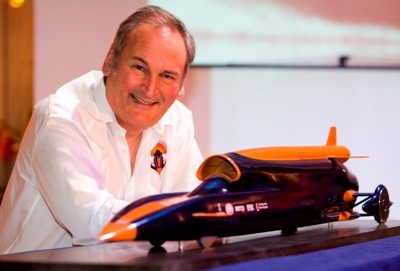 The ThrustSSC programme started with a £40,000 sponsorship from Castrol and a two year research programme involving Computational Fluid Dynamics and supersonic rocket model testing headed by veteran missile aerodynamicist Ron Ayers and mechanical designer Glynne Bowsher. While test results for the huge 11 tonne, 110,000hp car were exceptional, again the finance was a serious difficulty. The large companies were concerned about risk while the insurance companies gave ThrustSSC the same insurance rates as a domestic car. The large sponsor target companies failed to understand that the benefit comes from taking part. With failure of the planned centralised funding, the project funding had to come from a wide range of supporters, with products from 215 companies and merchandise sales to 4,800 members of the supporters club and internet followers all over the World. The ThrustSSC website driven by Jeremy Davey was the first to demonstrate end-to-end electronic trading in Britain. Because of the financial difficulties Richard had to concentrate on funding and give up his driving role. A 6-month competitive evaluation on the 32 driver applicants resulted in a win for Andy Green, an RAF Tornado pilot with 1000hrs experience in fast jets. First high speed trials in Jordan went badly with a poor overall performance, but by May '97 the team was back in Jordan again with spectacular results - car, driver and team were ready for the supersonic trials in the US. Completion of the project required $900,000 and the funding eventually came from a few sponsorships, the 4,800 person Mach 1 supporters club, the internet followers and readers of the Daily Telegraph. More spectacularly, after failing to find a fuel sponsor the 1 million litres of jet fuel needed for the project's HeavyLift Antonov was funded by the internet followers. 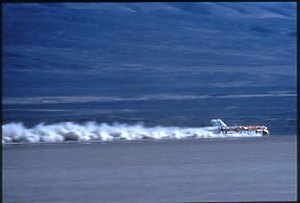 Once on the Black Rock Desert, Nevada, the team achieved a new land speed record of 714.144mph - a huge increase of 80.86mph on the existing Thrust2 record and the largest increase in land speed record history. On 13th October the car went supersonic for the first time and then made the mandatory two supersonic passes over the mile within 60 minutes on the 15th October. No other car has run supersonic and the new World record stands at 763.035mph for the mile. Global response was substantial with the project featured on the front pages of almost all the World's major newspapers. The 9 television documentaries have been run almost continuously for the last 8 years, and a column kilometre of press coverage was achieved in UK media. All the £300,000 debts were finally cleared 6 months after completion of the record. The project can be viewed on its 800 page website www.ThrustSSC.com, which achieved 59 million page hits in 1997. This company developed a new form of funding television productions, resulting in the funding and screening of 'The Great Race', an 8-programme prime-time television event which involved a drive from London to New York, via the Channel Tunnel (before the lines were laid) and over the Bering Straits. The event was a huge success for main sponsor Ford with valuable exposure of the new Mondeos operating in impossible Siberian conditions. 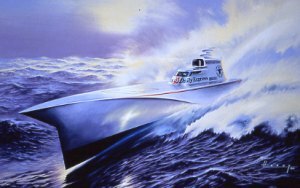 This was an attempt to develop a high speed research vessel to achieve the Blue Riband - the unrefuelled record track from New York to the Scilly Isles. The project set out to develop the ship from the Breguet Range Equation, the all important aviation equation which defines the range of an aircraft taking into account all the major variables. An advanced Serter deep-vee semi-displacement hullform was created and developed in the HSVA tank in Hamburg: the hull would carry the heavy fuel load and maintain 60 kts in sea state 4. The aerodynamics were proven in the British Aerospace wind tunnel in Hatfield. Power was from the project's own Rolls-Royce RB-211 jumbo jet engine which had been acquired from a scrapdealer and then successfully run up on test . The potential for the 134ft craft was a 60 kt unrefuelled record which would stand for a very long time and a major lead in marine engineering. Despite efforts in Newcastle and Bremen the Atlantic Sprinter, which featured a unique monocoque hull construction using extruded Hydro-aluminium planking designed by Ove Arup, was never built. 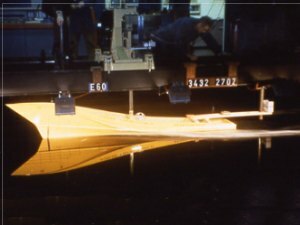 Neither the UK Government, nor the famous UK shipyards, showed the faintest interest in developing the advanced hull or its construction, even though the new hullform would revolutionise high performance sea vessels by enabling high speed in rough seas with minimal slamming and high levels of stability. Aircraft Richard had learned to fly as part of the Thrust2 programme and challenged current thinking that leisure flying should be so expensive. The reason was because of use of old American product with airframes dating from the 1950s and engines from the 1930s. The ARV Super2 featured a new custom-designed lightweight Hewland engine and that enabled the aircraft to be reduced to 66% of the size of the American product while providing better handling and carrying the pilot and passenger with a 100mph cruise. The smaller size reduced acquisition cost and operating cost, while exceptional handling compared favourably with the standard American products. Featuring superplastic aluminium construction the Super2 was 20 years ahead of its time and the all-metal plane flew just 13 months from a zero cash/zero engine start-up. 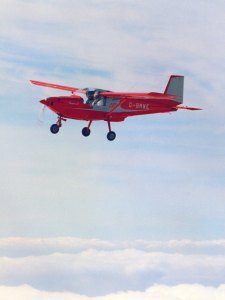 After a running battle with the CAA (Civil Aviation Authority) the aircraft was certificated in 18 months and went into early production at Sandown on the Isle of Wight with a workforce of 127. Minor engine problems and a sudden drop off in orders as well as a change in ownership and management contributed to the demise of the company in 1988 with 37 examples built and sold. 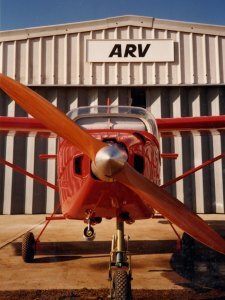 As a result of the US FAA easing of certification requirement for very light aircraft and the introduction of the less onerous licencing for sport pilots operating light aircraft, the ARV Super2 goes back into production as the Opus in 2006. Looking back on the entire programme it seems that the ARV was just 20 years ahead of its market. The Thrust2 programme started with the objective of regaining the World land Speed record - an achievement which had been dominated by the British since the 1920s, and then lost in the 1960s when the traditional competition, the Americans, switched to jet powered cars and took the record from 400mph to 600mph in 18 months. The Thrust2 programme started with just £175, the capital realised from the sale of the very dangerous Thrust 1 car to a scrapyard after a major crash in 1974. Design of the 35,000hp Thrust2 was by John Ackroyd and build took place on the Isle of Wight. After achieving the British Land Speed Record at Greenham Common in 1980, three trips were made to the US, in 1981, 1982 and 1983, before the World Record was finally achieved in 1983 - at 633.468mph. During the programme Richard and Thrust2 had exceeded 600mph 11 times and at peak speed (650.88mph) the car was just 7 mph away from catastrophic take off. Thrust2 and ThrustSSC can be viewed at the Museum of British Road Transport, Coventry. The programme featured many of the hallmarks of later ventures. A small team with determination and very limited funding. 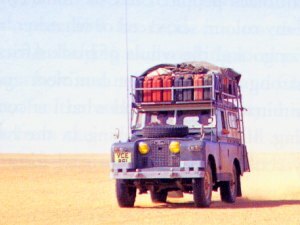 'London to Capetown - small expedition': 160 Times readers replied, but when they realised that the trip involved crossing the Sahara and Congo on 10,000 miles of rough road in a 13 year-old short-wheel-base Land Rover, 97% dropped out. The trip was achieved with a team of six and apart from a major breakdown in the central Sahara, 200 miles from water, the team made it through in 4 months. The small matter of South African customs duty made it important to return the Land Rover to the UK and this was achieved in five months with a new team, via India, Kashmir and Afghanistan. Because the return team had concentrated on eating local foods, an £18 refund was in order on each members' £50 food contribution - after 5 months! All told the project paid off all the expedition expenses and netted £126 for 12 months work.